I started general Gunsmithing here in Fremont as a hobby to support my shooting habit. I hung out at a local gun shop on Saturdays and helped them out for free so I could get my hands on different types of firearms and learn about them. Anyway, I was watching the owner’s son beat the hell out of a Colt Woodsman trying to get it apart so he could “FIX IT”. He was just about to throw it across the room because he could not figure out how to take it apart when I stopped him. I asked him if he would let me try my hand at it and he said some choice words to the effect that if I thought I was so smart to go right ahead. I took it apart, fixed it, and reassembled it. I didn’t realize that the owner was watching. When I was through he walked up and asked me if I wanted to start doing some repair for them. So started my career in Gunsmithing. I worked for them for about 3 years as a part time gunsmith until their store folded up. There was a new local sporting goods store that opened and they approached me about building up their gun department and doing gunsmithing for them on a full time basis. The job that I had was not going anywhere so I accepted. 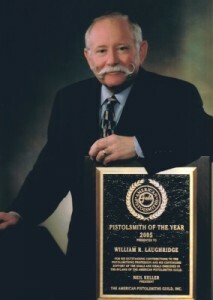 I worked for them for about 4 years and built up the gun department and the gunsmithing business to a great success. I had really started to get into the 1911s as there was a local IPSC club and the members were bringing me their 1911s to build up. I decided to buy the Gunsmithing business from the store and start concentrating on handguns. 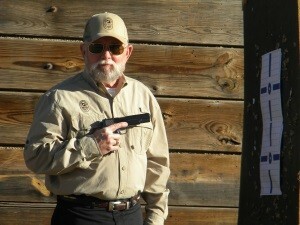 I had gone to Second Chance several times with several of the IPSC shooters. I always took some tools and parts to fix our 1911s if needed. I always ended up working on quite a few other shooters 1911s while I was up there. It occurred to me that there was a good business opportunity to really get serious about repairing and customizing the other shooters handguns and shotguns during the Second Chance Shoot. So, the next year after I purchased the Gunsmithing business I drove my old Dodge Van up to Second Chance and set up shop in a GP Medium Tent that I had checked out of the Armory. I was in the Army Reserves so they would let me hand receipt the tent and use it, I spent 23 years in the Army reserves, but that’s another story. Second Chance was really growing and I think it was the 2nd year that I was up there with my tent I met Evan Marshall. He was competing and needed his pistol fixed. I fixed him up and he asked if I would customize a revolver for him so he could write an article about me for the American Handgunner as a new pistol smith. I did the job, he wrote me up, and, as they say, “The Rest Is History”. I opened Cylinder & Slide Inc. in November 1978 so this will be my 36+ year in business for myself. It really doesn’t seem like it has been that long until I look back at some of the old pictures of myself at Second Chance and note that I had all of my hair and it was almost blond instead of gray and my mustache was red instead of gray! I’ve had that damn handle bar mustache for darn near 43 years. My good friend who designed my logo decided that I should put my mustache in the logo. Guess that I can never shave it off until I quit being Cylinder & Slide and I don’t look for that to happen very soon. I promoted Cylinder & Slide by buying a special built shop trailer and traveling to most of the major IPSC matches and repairing the competitors race guns so they could continue shooting. I did this for about 18 years. I stopped doing this about 17 years ago. The big matches have died off and I am getting to damn old to haul that trailer from coast to coast and border to border. I bought an ‘86 Ford diesel dually to pull the trailer with. My average speed was 50 MPH. You can guess how long it takes to travel to California, New York, or Florida from Nebraska! I’ve met some really great people and made some life long friends while traveling to those matches. I wouldn’t trade it for anything. Hell, I think that I’ve fixed a race gun during a match for just about every one of the big name shooters. I don’t know a one of them that isn’t a nice guy and willing to help an up and coming shooter. Says something about our sport doesn’t it! Well, enough of my ramblings. I guess as I look back on everything there aren’t to many people who get to make their living doing something that they really like doing and meet some of the finest people in the world while doing it. I would have to believe that I have been blessed.